Waynesboro Police are investigating a burglary at the Waynesboro Kmart that led to the theft of several items of jewelry. On Saturday at around 5 a.m., officers with the Waynesboro Police Department responding to a burglar alarm at the Kmart discovered the glass in the front door had been broken out. The store, located in the 2700 block of West Main Street, was searched, and no suspects were located. Officers did discover that a portion of the jewelry counter had been destroyed and several items of jewelry appeared to be missing. The suspect was observed on store security footage as he smashes the jewelry counter and collects multiple items. 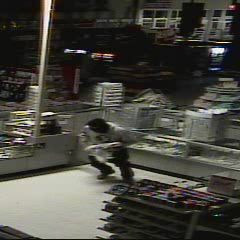 He then moves through the store, eventually exiting through a rear fire door. Anyone with information about this crime, or who believes they know who the subject in the photograph is, are asked to contact Cpl. Scott at 540-942-6684 or Crime Stoppers at 1-800-322-2017.